First Aid Training Co-operative’s most popular courses are available to book as an individual and take place in convenient local venues across the UK. These courses are suitable for employers, community organisations and individuals. Anyone who needs to fulfil legal and regulatory requirements, or wants receive life-saving training and increase their personal or professional knowledge. There’s no need to have had any previous First Aid Training, just book online and come prepared to get involved! 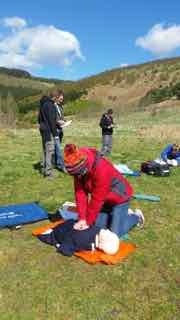 The Co-operative is Scotland’s leading provider of NGB approved Outdoor First Aid 2 Day - 16 Hour courses. Our public first aid courses are extremely hands on, and include both theoretical practice, and practical scenarios. This makes certain that you feel knowledgeable, prepared and confident in providing effective first aid both at work and in day to day life. We view slide presentations as a necessary evil – we keep them to an absolute minimum and concentrate on giving you as much practice as possible during your course. Our highly experienced, approachable and professional trainers ensure that our courses are memorable and easily applicable. Our trainers have a range of backgrounds including paramedics, mountain rescue team members, paediatric specialists, stalkers, foresters, sports coaches and many more. With outstanding client feedback and years of experience, we make First Aid Training enjoyable, convenient, relevant and, most importantly, life-saving.